When I heard that an Indian restaurant was serving blue cheese naan and gulab jamun caviar on the menu? I was really intrigued! I headed to Chakra, in the classy suburbs of Chelsea with my favourite plus one on a warm, bright evening. Feeling rebellious and celebrating the start of the week we ordered a cocktail each. A Mango martini for myself and a Moscow Mule for him. The new summer menu had just launched so we had a look through and decided what to have for starters. It was a tough choice as the menu had some interesting modern twists to dishes as well as some innovative dishes. Some dishes were not available unfortunately, but the dishes that we did choose as alternatives more than made up for it and just means we have an excuse to go back! Amit was in the mood for lamb and so we ordered an inside out lamb burger, which was served with mustard chutney, harissa and chilli lime chips. Amit thoroughly enjoyed the lamb. It was very well seasoned and flavoured and marinated so well. Reminiscent of shammi kebab in a burger form – heavenly. Our second choice of starters was crispy Avocado spheres served with curry leaves and a tomato and date chutney. I have never eaten avocado in this form before so wasn’t sure what to expect. It exceeded my expectations though and it was just ridiculously good. The texture was like croquettes with a lovely crunchy exterior and a warm, soft and flavoursome interior. It was the perfect evening for a refreshing salad and so we ordered a Pomegranate, mango, papaya, coriander, spring onion and red amaranth salad. It was tropical, tasty and just so summery. Really enjoyed it. Next up was mains and I was now nervous about ordering the Blue Cheese Naan. Reassurances that it was really good from the waitress made me stick to my guns and I was so glad I did as it was quite possibly the nicest naan I have ever had. The blue cheese flavour was so subtle but it worked so well with the naan. I was worried about how it would taste with the curry but it was divine. Amit had chosen the Tandoori poussin, which he had all to himself. I did manage to try a little piece and it was marinated thoroughly, melt in your mouth and just so scrumptious. It had a lovely smokey bbq touch to it in an upmarket way. My main, which I had the blue cheese naan with, was Grilled chicken breast in a tomato and cream masala and garnished with coriander. This was decadent, indulgent and just fantastic. As a side we ordered the Meloni Daal. It had so much flavour which was the tell tale sign that it had been cooked for hours – just how a daal should be! By this point we were in a food coma from all the fabulous food. There was not one dish so far that I didn’t enjoy. 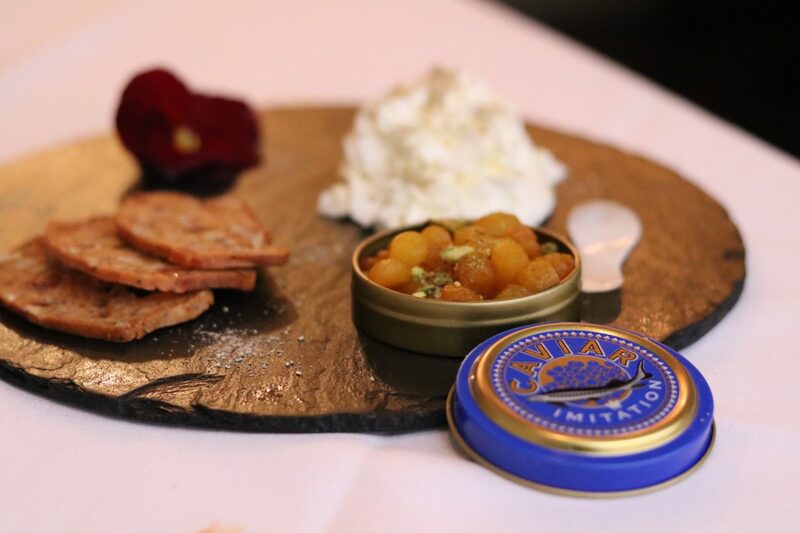 However, I reserved some space for the Gulab Jamun Caviar, which was served with Pistachio toast and cardamom creme. How novel is this? Not only did it look superb it tasted just so amazing. The little balls of gulab jamun really did resemble caviar and given the choice I would choose this type of caviar anyway. The pistachio toast and cardamom creme complimented the gulab jamun really well and I just adored the little tin the gulab jamun was served in. The whole experience was wonderful and I really enjoyed the modern twists and unusual choices on the menu. If you love Indian flavours but are looking for something different to your usual curry establishments this is a novel and very different restaurant and one I really recommend trying. There is some lovely outdoor seating in front of the restaurant which would be perfect for warm, summery evenings for some alfresco Indian food. I would rate Chakra 8/10. The service was good and the food was delicious. Disclaimer. I was a guest of Chakra and my meal was complimentary but all photos and opinions are my own.